Stephenson Memorial Primary School, North Tyneside – Celebrity Guided Tours, and an improved outdoor area. 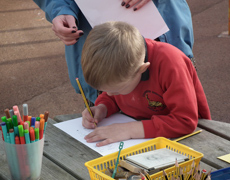 Stephenson Memorial Primary School received Creative Partnership funding to try and answer the following question – How can we create a stimulating outdoor learning environment for Key Stage 1 children to enhance our existing creative curriculum in order to inspire writing? Over a number of weeks staff and Year 1 children explored their outside space, thinking about what they did and didn’t like about it, and what they would like to be able to do. Throughout the process there were numerous opportunities to support writing using a range of contexts and styles. By the end of the process some children who had been previously reluctant to write were asking to write lists and instructions. Sometimes it is easier to see something familiar through someone else’s eyes so each child chose a well known person or character to invite for a tour of their grounds. The children designed invitations to send to their visitor and wrote lists of what that person might like and dislike, and then went about deciding on what to show them. They went outside and took photos of their favourite places, explaining what they did there. They also discussed which parts they thought their visitor might like or not like. Over the following weeks the children created maps of their grounds using photos, drawings and labels. They also used a range of resources to try things out – some fabric, pallets, ropes and chalk on the wall in an unused area became a stage for JLS and Cheryl Cole; mirrors, seating and planted tyres became a garden for the Princesses; and a larger, open area and materials including plastic sheeting, planks and bicycle handlebars became cars, trucks and rocket packs for the Superheroes. Year 6 pupils acted as the visitors and the children enthusiastically took Alan Shearer, Mr Potato Head, Cinderella and Hannah Montana around their grounds. Throughout the process the children were able to reflect on their grounds in terms of what they have and do now, and what they would like to be able to do. They showed great imagination and the next phase of the project will be to put in place some of the things they have identified they would like – a stage/performance area; a quiet seating area; increased opportunities for writing outside using a range of resources and materials; opportunities to display written work outside; and a series of inspirational resource boxes all of which can be used for teaching and play. This will be done on a minimal budget using recycled and donated materials where possible. There have been many learning opportunities within the process. 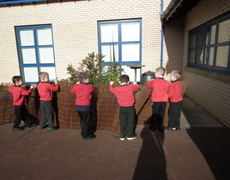 Outdoor activities have linked well to a range of indoor activities supporting many areas of the curriculum. The children presented a class assembly to the rest of their school and their families, a twilight training session was run for school staff. Most importantly it will be the children’s own thoughts and ideas which will inspire the space and how it will be used. 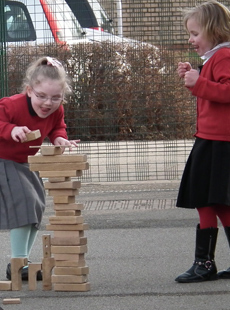 Using such a participative process has helped the children to fully engage in and have ownership over the project and its outcomes, and this will help to ensure the future success of the outside space as a place for creative learning and play. Support was provided through project and curriculum planning, workshops and activities for children, team teaching, and staff training. How big can we make the tower?